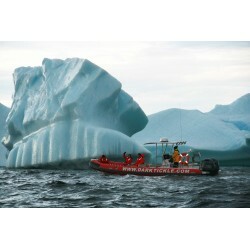 Icebergs, whales, and wild berries tour package! Information and itinerary on our Travel Offer Page. Please put requested dates in comment field on checkout. You will be contacted with availability and/or confirmation. Lunch at Café Nymphe/The Granchain Exhibit. Choices include dishes based on period French fare of the 18th century. Delicious desserts from wild berries of The Dark Tickle Company. Wine or beer included! Tour of a wild berry bog and processing facility. Over 30 native plants are interpreted. Watch the transformation of wild berries into our delicious products. Please put requested dates in comment field on checkout. You will be contacted with availability and/or confirmation. Cancellation with full refund up to 14 days prior to booking date. More info and itinerary here!